I decided to learn more about developing smart contracts, and since I learn by building stuff, so I decided to implement a casino roulette, with the business logic being implemented in Solidity, the language of choice to develop smart contracts in the Ethereum blockchain. Every bet has a fixed amount of 0.01 ether (around €6) and you can bet by clicking on the board. 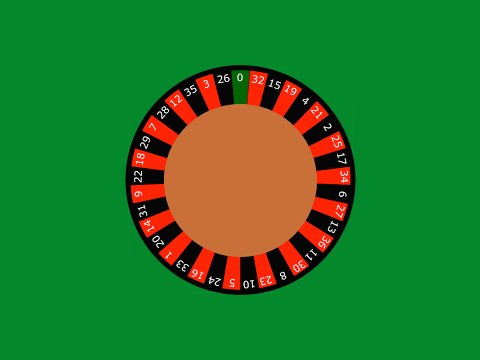 The roulette just accepts a bet when has sufficient funds to pay for it and every other active bet. Different people can be playing at the same time. One of the players will click the “Spin Wheel” button, which will generate a random number and all bets will be dealt with accordingly. When a player wins a bet, the payout is credited on his personal account. The player can, at any moment, click the “Cash out” button and receive their winnings. Run Ganache and keep it running. You now have the ethereum roulette on http://localhost:3000.